Photo Credit: City of Midland PLAY ON OUR FIELDS WITH A PURPOSE. 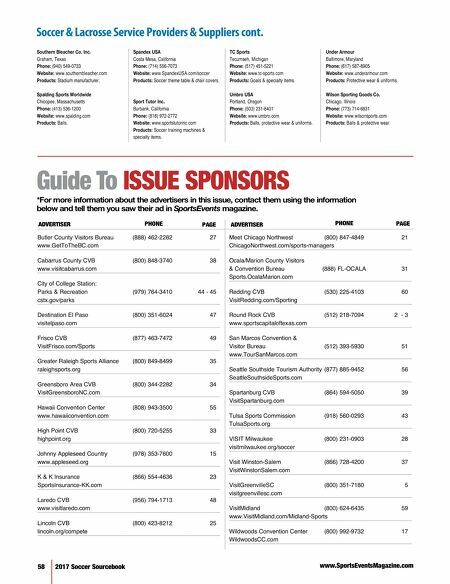 CONTACT US TO SEE IF YOUR EVENT QUALIFIES FOR A GRANT. 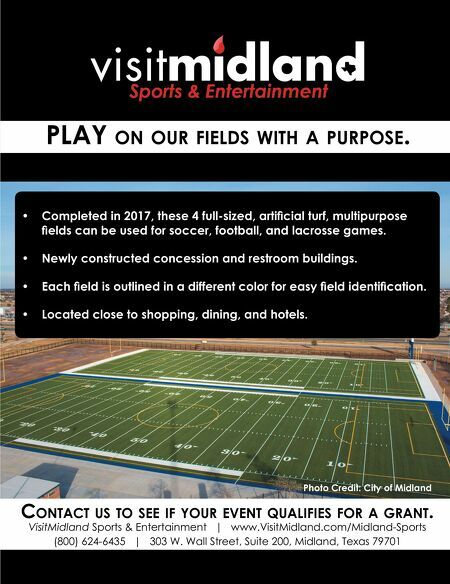 VisitMidland Sports & Entertainment | www.VisitMidland.com/Midland-Sports (800) 624-6435 | 303 W. Wall Street, Suite 200, Midland, Texas 79701 • Completed in 2017, these 4 full-sized, artifi cial turf, multipurpose fi elds can be used for soccer, football, and lacrosse games. • Newly constructed concession and restroom buildings. • Each fi eld is outlined in a different color for easy fi eld identifi cation. • Located close to shopping, dining, and hotels.